BIABAS Guindulman, Bohol October 13 (PIA)—House of IT (HoIT), an information technology business support provider arrives here to a community dressed to the occasion. Coming in to this village occupied by surviving members of the Eskaya tribe, seven Hoit representatives arrived to this community perched on top of the mountains of Guindulman, some 20 kilometers from the town center, to hand over the instructional materials for the Eskaya teachers. 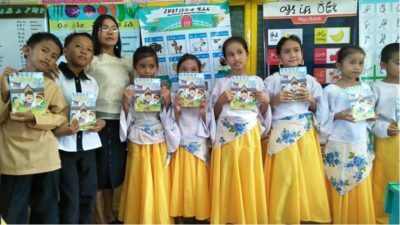 HoIT, in one of their corporate social responsibility projects, decided to produce digitized visual aids to help grade school teachers here and in a few more isolated villages teach back the quaint Eskaya language and their system of writing. Eskaya, a mountain dwelling tribe in Bohol owns patches of land here as the government awarded them their ancestral domains, explains National Commission of Indigenous Peoples (NCIP) Bohol head Sisinio Amplayo Jr.
Eskaya has communities in nearby Taytay, Duero, Lundag, Pilar, Cantaub Sierra Bullones, and Cadapdapan and Tambongan in Candijay, NCIP said. Amidst the threat of losing its unique language, teachers here race with time to teach grade school kids the rudiments of the Eskaya script, using crudely prepared flipcharts, shared Eskaya timama sundon (head teacher /supervisor) Julieta Vizcayda. Seeing the individually prepared instructional materials in their initial visit to the community, HoIT leaders decided to do the digitized instructional materials for Biabas and Tambis Elementary School’s 80 pupil-learners and 5 Eskaya teachers. HoIT, in partnership with Aninaw House of Artists commissioned artists to replicate the flipcharts in a bid to standardize the teaching materials. 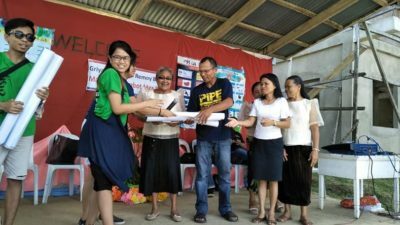 In coordination with the Department of Education, NCIP and the Philippine Information Agency in Bohol, HoIT took over a year to complete the teacher’s visual aids amidst validation from Eskaya communities and their teachers. That day, October 13, the community gathered at the village center: tarpaulin tents stood in the basketball, a banqueting table spread with native food, the village string band of banjo, banduria, guitar, ukulele and a bajo de arco provided rustic music. Eskaya sundon (chieftain) Jovino Datahan, Biabas Barangay Chairman Cleofas Pabon, teachers from the village’s two elementary schools and mothers clad in kimonas greeted the guests, ever appreciative of group and their project. On the stage pinned as event backdrop is the customary Eskayan greeting: Griyalo Lotarber Remoy Biyabe, which means Welcome visitors. On the basketball court, grade school boys in neat dark short pants and red shirts form a single file while the girls in pleated blue skirts and red shirts flanked them, smiles painted over all their faces. Some elder pupils came in white blouse and blue skirts, and at least two pairs came dressed in the customary Eskaya costume for the Sinarliston, a traditional dance still performed in these mountain communities. Several children also came in golden yellow skirt or loose pants and printed kimono blouses, a costume that stood out in the green environment. HoIT representative Lachmae Reboton, amazed and overwhelmed by the warm welcome could not hold her excitement. The community sang the national anthem and Awit sa Bohol in full Eskaya conducted by school teachers while Eskayan officials delivered their speeches and messages in the customary tribal language. “I can’t believe we would arrive to such a grand welcome,” Reboton, a first timer in Biabas blurted out and delighted that the kids and the entire community spared time to accept the instructional materials. “Thank you House of IT and your team,” Vizcayda who oversees the teaching of the Eskaya said as she meticulously reviewed the scripts that characterize the Eskayan writing. Included in the digitized materials turned over to the community are the Eskaya alphabet, colors, household pets, colors, taste and household utensils. HoIT also gave about 60 coloring activity books to the schools, given in simple turn-over a few hours later. Barangay and tribal council members also came home with at least some HoIT mugs, HoIT umbrellas for teachers, classroom wall clocks and other tokens.